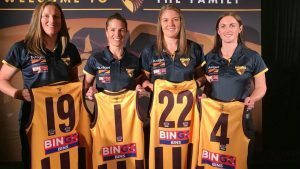 Emma (second from left) with her Hawthorn AFLW team mates. The Australian Football League (AFL) has done a great job of launching and promoting its AFL Women’s competition, so I was intrigued to read about a former rider who made the move from professional cyclist to AFL player. I actually met Emma Mackie a few years ago when she worked for Specialized and I was on a training course. We rode side-by-side and I asked her about her professional riding career. Since that time, it has all changed for her so this time I asked her about her new sporting career as an AFL player. Q: You reached the highest level of road cycling by racing at the World Championships. Did you ever think you’d have the opportunity again with women’s AFL? No, I never thought I’d participate in another sport on a professional level again after cycling. When I started playing football in Melbourne after I retired from cycling, AFLW didn’t even exist and I never really thought about playing football at such a professional level nor was it really an option. It was definitely more on a social level to begin with and a good way to keep fit but quickly grew into something bigger the more I got involved! Q: When did you start playing AFL? Did you ever dream of playing in such a high profile series? I played AFL when I was a kid, with my younger brother. We played Aus kick and also under 14s/17s for the Jindera Bulldogs. Once I turned 15 (I think I was 15/16) I was no longer allowed to play football with the boys and because we didn’t have a women’s league I stopped playing all together. I think as a kid I would have loved to have continued playing footy, I just loved it. But I also knew that I couldn’t play at a higher level because there just wasn’t the option for females. I went on to play netball and eventually started cycling which as you know continued onto a professional level. Q: You and I met riding side by side when you worked for bike manufacturer Specialized. Do you still ride regularly? Do you still race? Yes, we did! 🙂 Well truthfully I’m doing very little riding if any at all at the moment! Football has pretty much taken up all of my time so I haven’t been out on the bike for awhile. But when I do get a chance I love to go for a spin on the road bike or even a mountain bike when I can. It’s also great recovery for me to just spin the legs over and nice to break up the training. I definitely don’t race anymore, I actually pretty much stopped racing once I retired from professional cycling. I enjoy getting out with friends and going for social rides more than anything. Q: Does your AFL training regime have much in common with your previous bike training? It has some comparisons but also some very obvious differences. I think because I’ve been an athlete at a high level previously it has helped me transition over into another sport. I know my body really well, I know how much you need to put in to get the results as well as how my body reacts to certain training loads and recovery times. It’s also helped with my nutrition and what I need to eat and drink to keep my body going. Q: What’s been your biggest sporting achievement so far? Will your AFLW career continue? Well I’d say representing my country at the WC is something I hold pretty highly but also playing AFLW and being a part of a premiership team was something special too. I’ve just been announced captain for the Hawthorn VFLW team which is a high honour and privilege. Q: What do you think we can all do to encourage more women to ride bikes? I think cycling is a great way for women to keep fit, be social and get outside! There are so many types of cycling available, for all levels. So going into your local bike shop is a good step and get some local advice. Also connecting with your local cycling club is a great way to get introduced to the sport, that’s how I did it! I hope you enjoyed hearing about the transition from professional cyclist to AFL player. Share your stories about other female cyclists who’ve made a big transition via comments or the Women Who Cycle Facebook page.